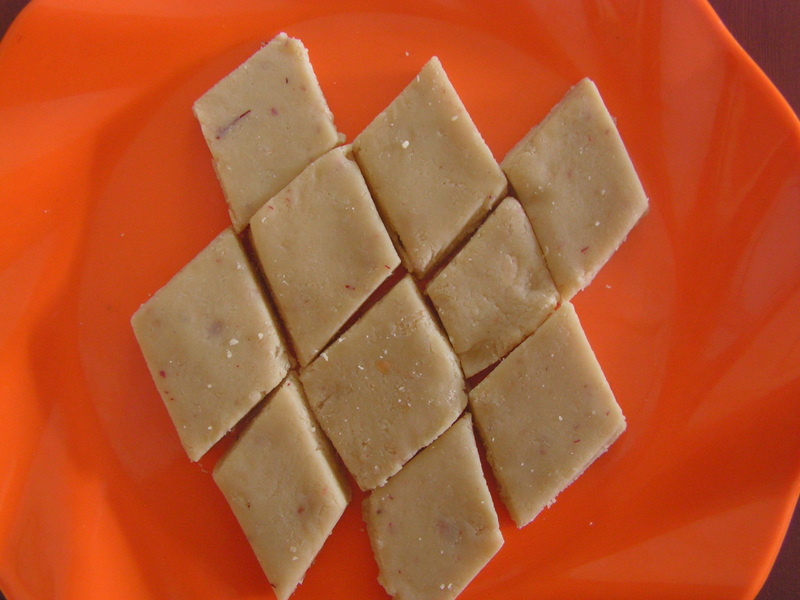 Cashew/Geru beeja/Kaju needs no introduction and it has ample of uses and is mostly used as an embellishing ingredient. 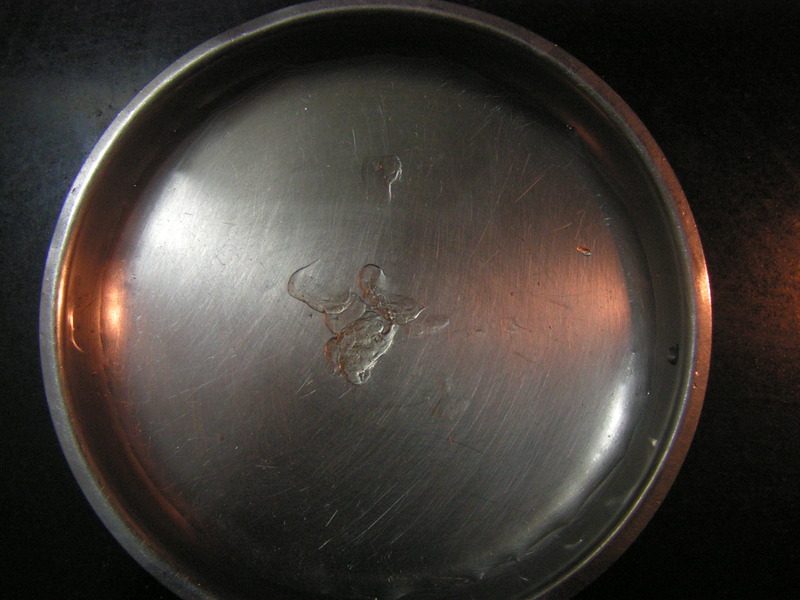 People use it in gravy for North Indian dishes for thickening just like South Indians use coconut milk. 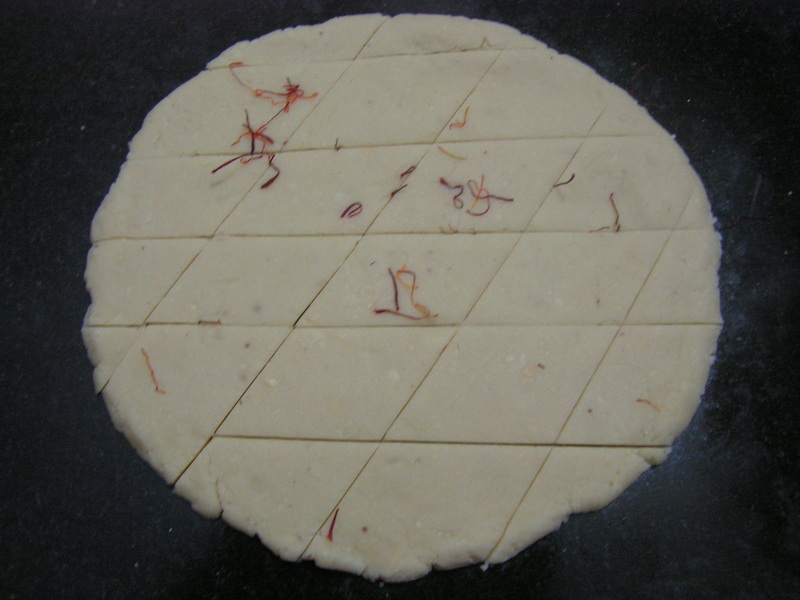 Today I would like to put up Kaju katli which is a very popular burfi these days. It is also one of my favorites. It is very easy and a hassle free dish for sure and can be prepared in 20-30 minutes. Here is my version of the same. 1. Powder cashews to a very fine consistency in the mixer. 2. Place a thick bottomed skillet on medium flame with sugar in it. Add required quantity of water to it. 3. Let sugar dissolve in water and keep adjusting the flame in such a way that the syrup when dropped in a plate with water should never dissolve when you touch. In other words the syrup is in between 1 and 2 string consistency. 4. At this junction add powdered cashews and saffron strands from step 1 to it and keep stirring for about 3-4 minutes simmering the flame and finally switching of the flame when it thickens. 5. To check if ready to be rolled, just roll a small pinch of the mix in between your fore finger and thumb. If you get a non stick ball, it means it is ready to be rolled to cut into pieces. 6. Roll the dough mix on a clean platform and cut it into required size pieces. If you are not able to roll it then you can just sprinkle a few drops of milk and roll it applying a little ghee to your hands for kneading and then roll subsequently. 1. Make sure you use fresh stock of cashews for the dish. Do not use the cashews stored in the refrigerator to powder it. 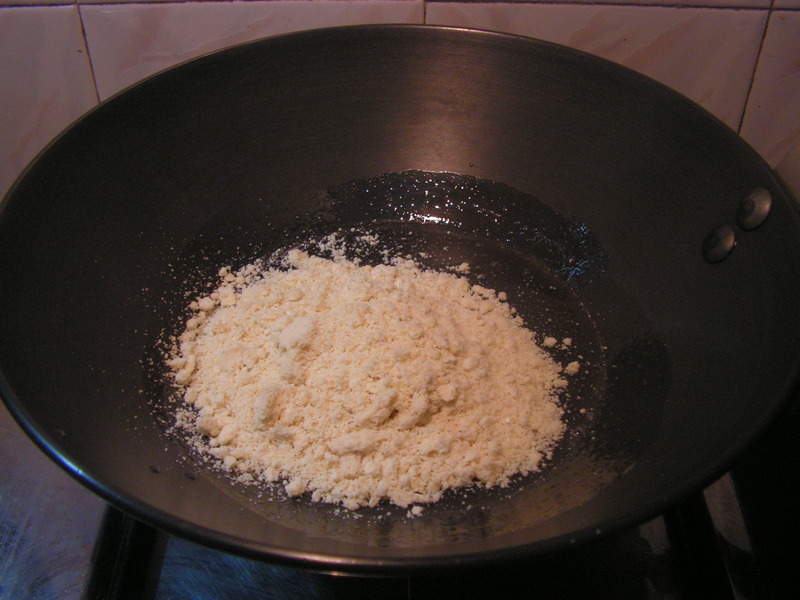 Allow it to regain room temperature so that the powder will be fine and will be best suited for the dish. 2. 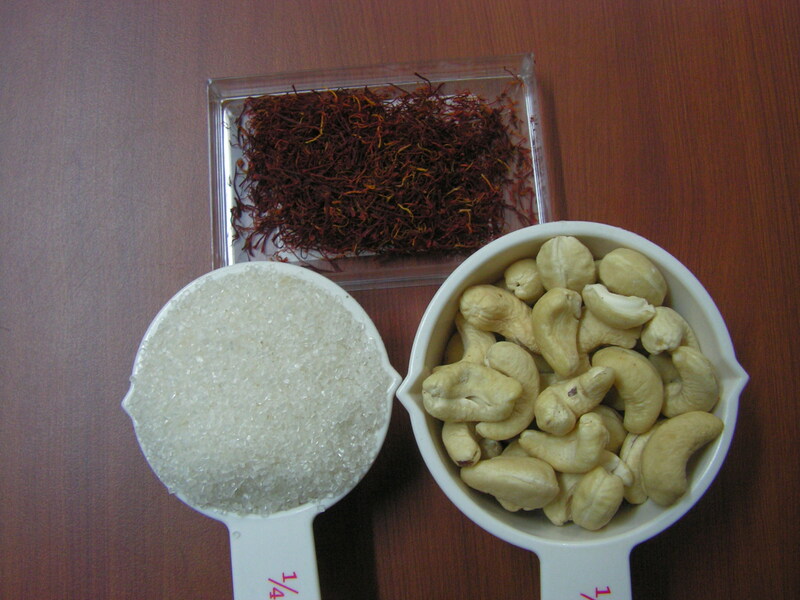 If the sugar syrup is not appropriate do not add cashew powder and it will not be set and will make the pieces turn sticky. 3. Be careful with the proportion of ingredients. There is little room for error ; stick to above measurements. 4. If one adds milk to set the dish then its shelf life of the same will be reduced. This entry was posted in Uncategorized and tagged Diwali recipes, Diwali sweets. Ricotta cheese Jamoon: The 500th recipe ! Here comes the 500th recipe on this blog. And naturally I am putting one of my favorite delicacies. Jamuns are an elegant dish and can be served for most occasions. You can even have this prepared couple days in advance of a party which can’t be said of most deserts. My mom used to make this with home made cream with some all-purpose flour with a pinch of cooking soda. That is one of its kind and I will put that up soon. When I made this we were in New York and ricotta cheese was available readily and it was a good chance to make this one ! Enjoy away! 1. 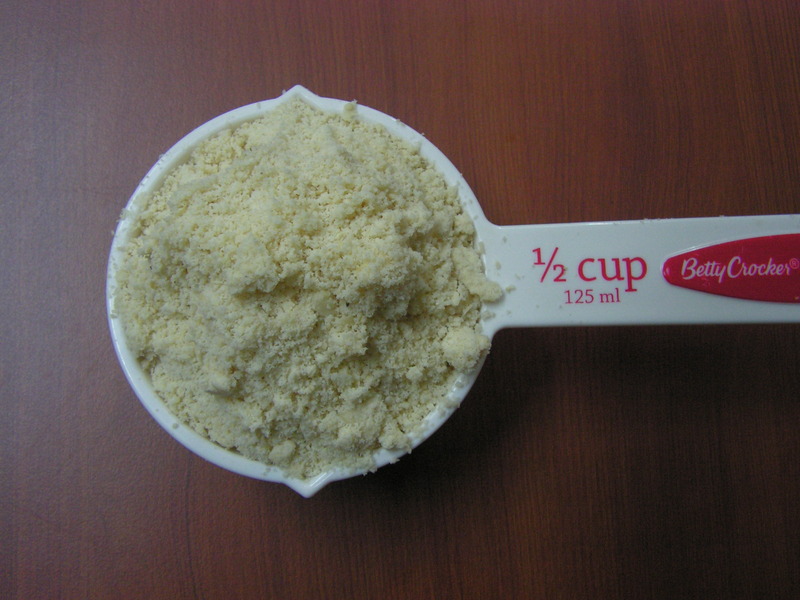 Empty the cheese can and transfer the contents to a broad bowl and put it on normal heat and stir it well with a wooden spatula till it turns like granules. 2. Sieve maida with baking soda and keep it aside. 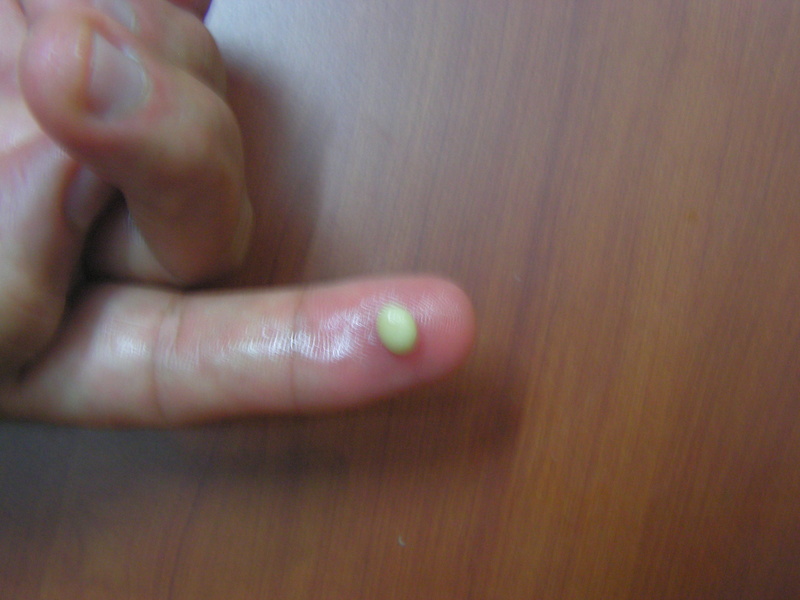 On cooling mix it to the ricotta cheese and shape it into round balls greasing your palm. 3. Place a skillet with cooking oil in it on low/medium flame. On heating add one by one like 5-6 in a batch and fry them till it is light brown. 4. Peal and powder cardamom and keep aside. Also keep ready a few strings of kesar too. Grate a few pista too and keep it aside to garnish jamoon while serving. 5. Heat water in a pan and on boiling add sugar to it and boil for about 5 minutes. Add lemon juice to it. Add cardamom powder from step 2 to it and also add saffron strings and switch off the flame and keep it aside. 6. On jamoons being cooled add it to the syrup. It swells and turns smooth and yummmmmmmmmm Garnish with pista and enjoy!!!! 1. Cheese should be cooked just till it tuns into granules, but should not be totally dry!!!! 2. If it turns difficult to shape them one can add a sprinkle a little milk to the dough. 3. Always fry jamoons on low flame only. The reason being that if one fries it on high flame it only turns brown from out side without being cooked from inside and in turn jamoons will be hard as a result. 4. Always add fried jamoons on cooling to the hot syrup so that they absorb the syrup and turn out very smooth. 5. Lemon juice is added for to avoid the syrup from crystalize on cooling!!!. This entry was posted in Uncategorized and tagged Diwali sweets, Sweets. Chirotis, The Ultimate Diwali Edition ! This was a long awaited dish on this blog but I thought of sharing it during Diwali and hence the delay. I learnt this from my mom in law whose preparation I hope to match shortly. She always prepared it whenever she visited us since my elder son loved this dish. Now my younger daughter-in-law is a big fan of sweets and since we both are here for Diwali thought of preparing it and relishing it with them. This dish is a little laborious but very tasty and delicious too. Here is my version of the dish. 1. Sieve rice atta and maida in the sieve along with salt. Mix it in a broad bowl with ghee and make it into bread crumbs. Add water slowly in such a way that it turns into a soft dough on kneading. Keep it aside for about 30 minutes covering it with a clean and a little damp cloth. 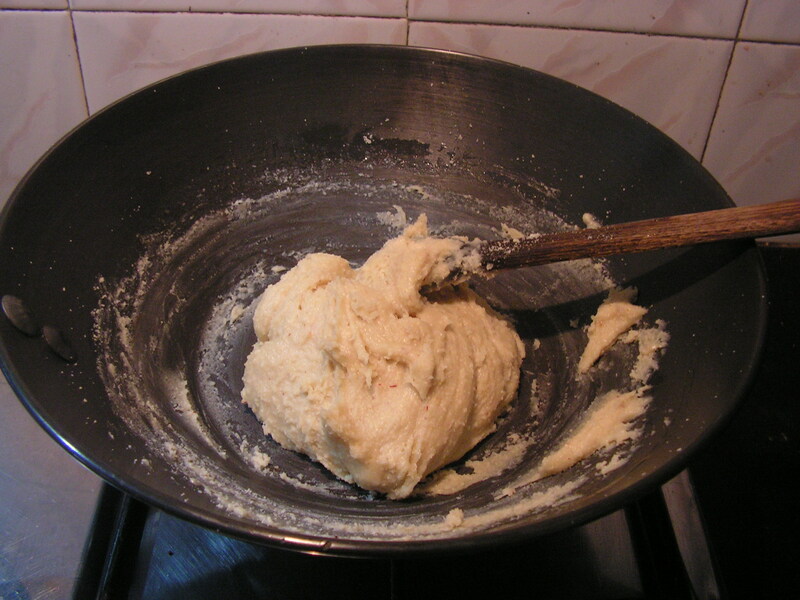 The dough is as shown in the image 1. 5. Cut it into 1/2″ circles and in all we get around 20 of the below size. 4. Roll it evenly to a medium thick consistency so that one is able to view the layers. 5. 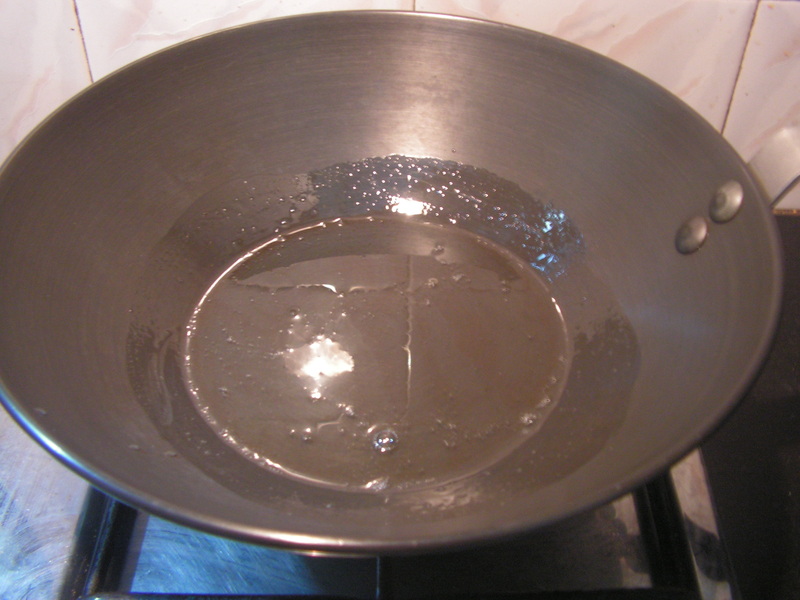 Place a skillet with a cup of cooking oil in it on medium flame. On heating fry 2-3 at a time and pressing it slightly in the middle and then reduce the flame latter to gain the colour and crispiness flipping it on the other side too. 6. Just fill it in powdered sugar to coat it on both the sides soon after fried so that sugar powder is coated well holding it with a holder. Enjoy the great sweet!!!!!!! 7. Ready to serve chiroti is as shown in the image below!!!! 1. Knead the dough smooth but make the dough little hard. 2. The roti should be rolled so thin like a trace paper that even if it tears it should be fine!!! 3. Applying pure ghee is always recommended instead of oil/dalda etc..
4. Roll it in powdered sugar immediately after frying in oil else it will not hold well together and may turn tasteless. This entry was posted in Uncategorized and tagged Diwali sweets, Festival food, Sweets. Let me wish all the viewers of my blog “Happy diwali ” and thank you all for your continuing support as we enter the year 6 of blogging. In keeping with my Diwali tradition, let me put up a sweet recipe for this Diwali. I have put up Coconut-Rava laddoo as Sankashti prasadam but this variation of Rava Laddoo is even easier to make, especially for those who want to make their first Diwali sweet ! Happy Diwali again. 1. Place a skillet with 1 teaspoon pure ghee in it and roast sujee till you get a pleasant aroma. Place a spatula with a little ghee in it and fry cashew powder in till light brown and crispy. 2. 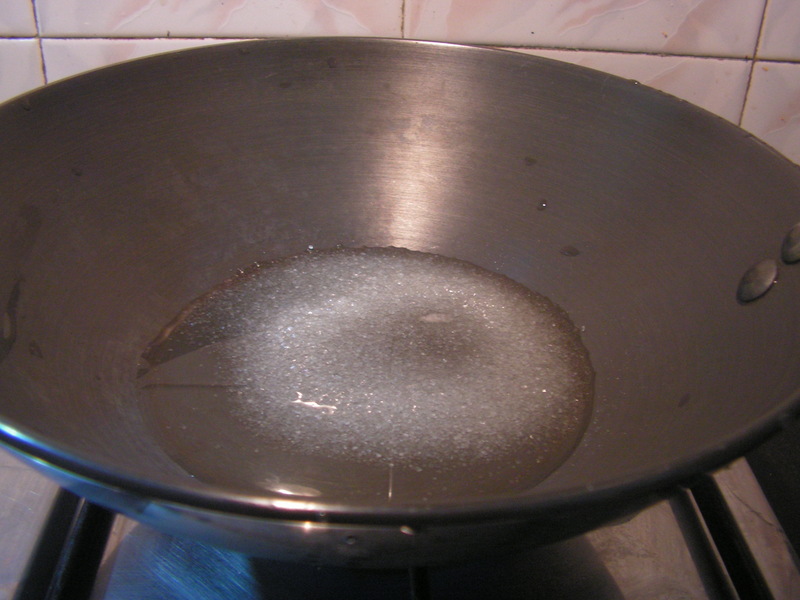 Place a skillet on medium flame with sugar in it and warm it up till it starts crystallizing. Cool it and powder the same in the mixer. Peel and powder cardamom along with sugar. 3. Mix powdered sugar, rosted sujee, roasted powdered cashews and fried Raisins in a broad bowl. 4. Mix it and add luke warm milk to a part of it and tie round laddoos adding a raisin to it and there you have your yummmy laddoos. Enjoyyyyyyyyyy ! 1. Roasting sujee till you get a pleasant aroma enhances the flavour, while roasting sugar makes the Laddoos firm ! 2. Adding roasted cashew powder is to avoid people from discarding it from the laddoos ! 3. Do not warm milk to the laddoo mix since it will be difficult to tie laddoos. Hence add in parts and tie laddoos ! This entry was posted in Uncategorized and tagged Diwali sweets, Laddoos.